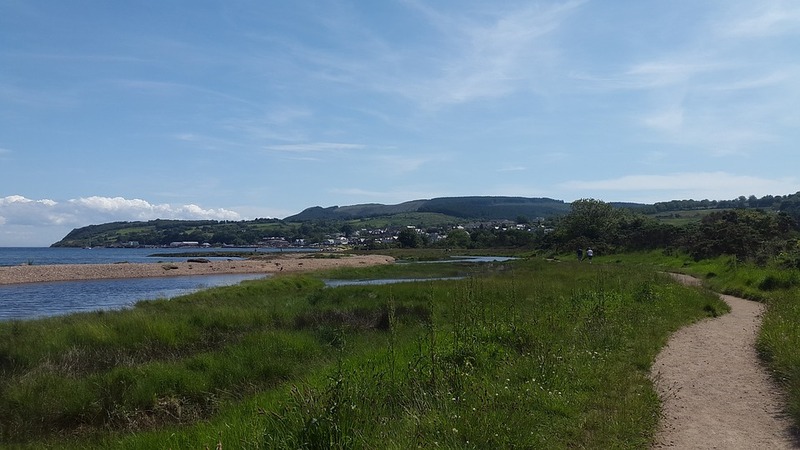 Hiking up Goat Fell, watching the wild deer gathering around Lochranza and exploring the beautiful grounds of Brodick Castle were just three memorable moments during a long weekend visit to the Isle of Arran. 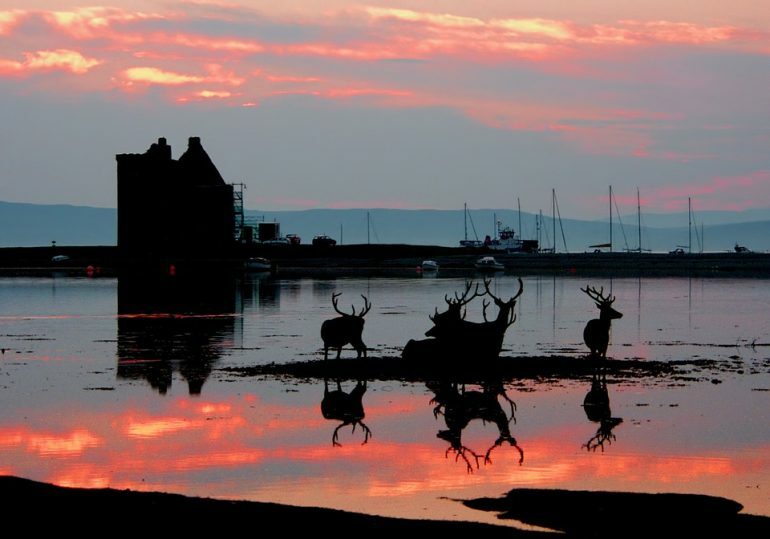 It is the seventh largest of all the Scottish Islands, there are over 800 in total, so there is plenty to see and do. 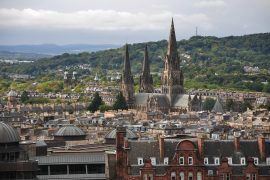 Often affectionately referred to as “Scotland in Miniature” , this stunning Island is easy to reach and has some truly spectacular coastlines and mountain scenery. It is also teeming with wildlife, a nature lovers paradise. 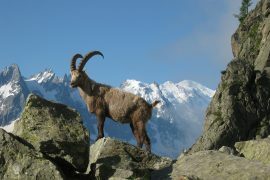 It is not uncommon to see deer, seals, birds of prey, red squirrels and a whole host of other animals on a visit. Annie, on her first proper holiday, and I visited the Island in June with my parents. Despite a mixed bag of weather, we had a blast. Sitting at 2,867 ft above sea level it is the tallest peak on the Island and one of four Corbetts. For Scottish mountain newbies, Corbetts are classed as mountains that stand at over 2,500 ft and Munros are those over 3,000 ft. Unfortunately, the weather was not great when we visited but, used to Scottish climates, we were not going to let it stop us from having a good time. We opted to walk on the day the weather was meant to be the best. High winds and rain were still forecast so we made sure we were prepared with waterproofs and woollies. 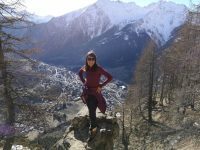 The walk can take anything from around four to six hours, depending on conditions and walker fitness. The weather was kind to us for the first half of the walk. We parked opposite the Wineport Bistro, an unmistakable and very pretty pink building. The initial trail follows woodland paths around the Brodick Castle Estate and there is a steep ascent through a woodland path. It then opens out so that you are rewarded with some fantastic mountain landscape and views back down to the coast. We at least got clear views at this point. For most of the walk, the paths are well marked and easy under-foot. As you come towards the final ascent, the path becomes more uneven, steeper and exposed. 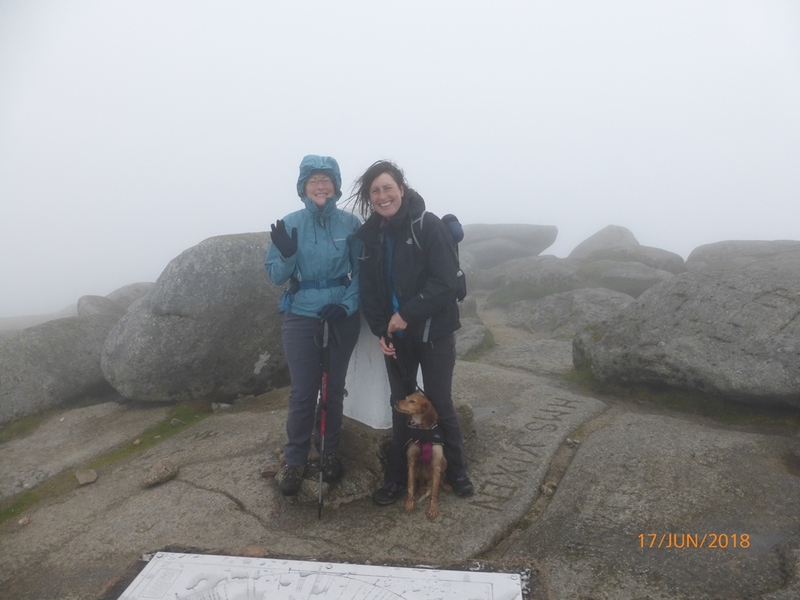 It was extremely windy and wet by the time we reached the summit and we did not get great views but it felt fantastic to reach the ridge regardless. The wind and cold conditions made it a tough climb. On the final ascent there are some steep drops and, if you are, walking with a dog I would recommend having them on-lead at this point just for extra safety. On the descent, we found a sheltered spot to stop for a sandwich break. We all needed it and it was nice to get out of the wind and enjoy a wee cup of tea! 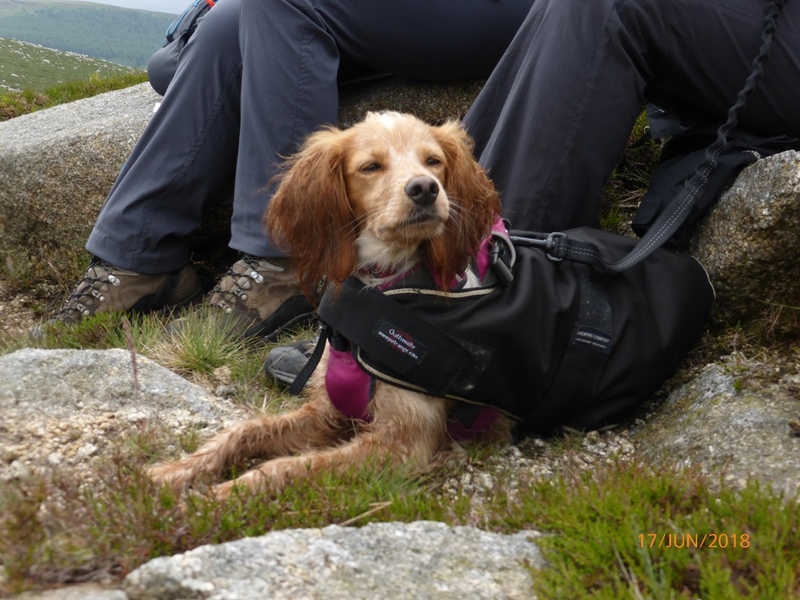 Annie, who already had our own wee coat, needed an extra covering as she was chilled from the conditions at the top. This is a reminder that folks might scoff at using a coat for your dog when “they already have one anyway” , but not all dogs are made for tough conditions. Come prepared for your dog as well as yourself. This was her first proper hike and, despite the chilly conditions, she loved it. There is an abundance of wildlife on Arran in general and she was in her element, her nose was on overdrive and her tail was up the whole time. It was changed days from when she first arrived and it was always tucked right between her legs. We took shelter in the grounds of Brodick Castle on our way back down for a much needed final tea break. Yes, my family are a bunch of tea jennys. There was work underway in the Castle itself so there was no access to the main building. It did mean there was no charge for access to the grounds though and they were treat enough. Expansive, varied and extremely beautiful, make sure that the Castle is on your list of must-sees on the Island. We walked from Brodick along a really beautiful and peaceful stretch of beach and then up to the Wineport Bistro for tea and cake before heading into the Castle grounds for a wander. Dogs are allowed in the grounds as long as they are on lead, so Annie came along too. The highlight of the visit for us was the red squirrel hide. We weren’t expecting much but, after sitting quietly for just a few minutes, we were treated to a bunch of squirrels coming into view to grab some food. We sat for over half an hour, enjoying their antics along with a host of birds too. It was a total treat! We only left because it was a damp day and we were all starting to get chilly. The Bavarian Summer House is also not to be missed. 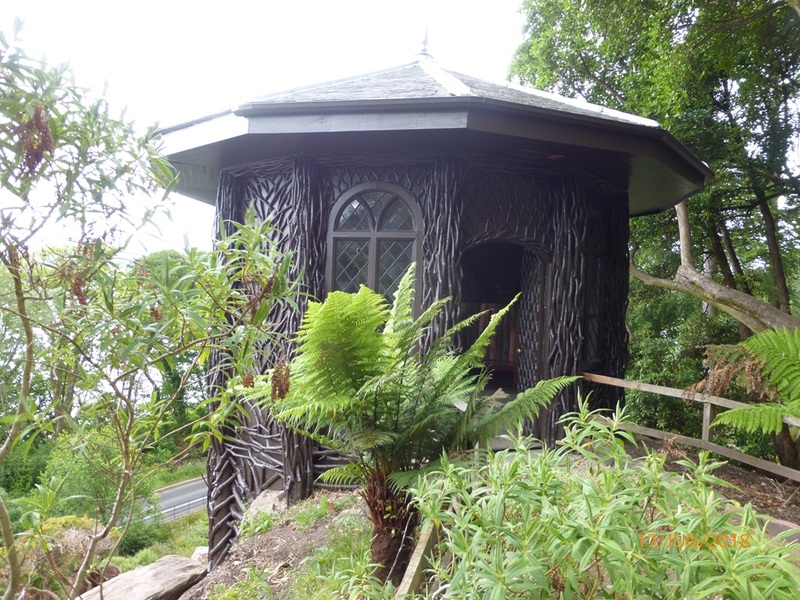 We spotted it when driving along the road at the edge of the Castle grounds and wondered what this unusual wooden building was perched high above the estate walls. It is such a surprise inside with walls and ceilings covered in acorns in intricate patterns. There is an awesome, newly completed, very big adventure playground too that will keep the kids entertained for hours. We opted to stay at the Youth Hostel in Lochranza. It is on the other side of the Island from Brodick and Goat Fell and it is a lot quieter and unspoilt. The drive across the Island is spectacular and, as you drop down the valley toward Lochranza you are often greeted by the sight of herds of wild red deer on the side of the mountains. Watch out for the cyclists too. It is a popular Island for cycling and some of the roads are pretty narrow. At dusk the deer head down towards the village and, if you are quiet and patient they often come very close. We saw a mother and her fawn just a few metres away, unfortunately, we struggled to get our camera out in time, but it was a real privilege to see them so close by. 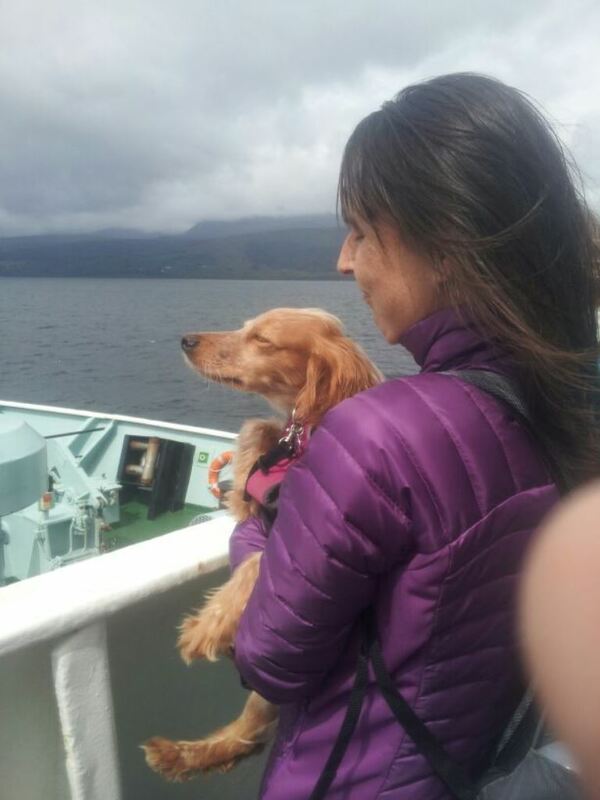 Some Youth Hostels have a no dog policy, but Lochranza is very welcoming. Annie was also allowed to join us in the quiet communal area. She had to stay in the room when we ate in the dining room though. 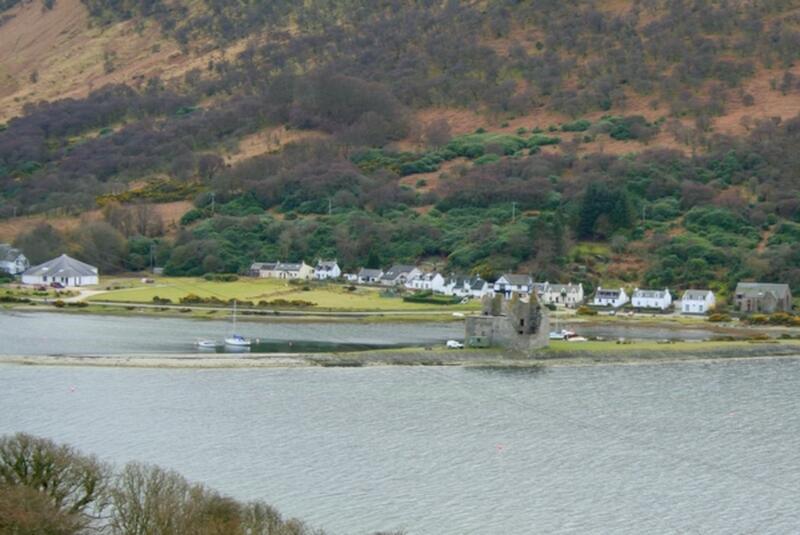 You are treated to views of Lochranza castle from the grounds too. The Castle is a picture perfect ruin that juts out in a little peninsula and when we visited we had the whole area to ourselves, except for the wildlife of course. Although we didn’t visit it, the famous Arran Distillery is also located on this side of the Island and, for Whisky lovers, is worth stopping by from a wee Dram. We enjoyed another walk on a different part of the Island another day. 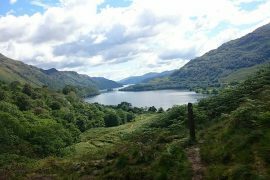 It is less of a challenge than the Goat Fell Hike, so if you are looking for something a bit less demanding this hour and half circular route is a good one to opt for. There is a signed car park a few kilometres outside of Blackwaterfoot. The first part of the walk is through some woodland, be prepared for the midges! There is a climb through the forest before coming out to open views of the sea. You make your way down closer to the coastline before coming to the open gates for the cave. Legend has it that this is the possible hiding spot for Robert the Bruce, where he was said to have had his famed encounter with a spider attempting to build its web. Have you ever heard the famous saying “If at first you don’t succeed, try, try again” ? The gates are always open and the cave is big enough to explore inside. The walk is only around 4.5 km and with the added interest of the cave, it would be a good one to do with children. We stopped in at a takeaway cafe in Blackwaterfoot called On A Roll for some really tasty butties for lunch. The same day as our King’s Cave walk we also trekked across Machrie Moor to visit the Stone Circles and Standing Stones. It is not a difficult walk, there are well-trodden paths across the farmland and you, obviously, can’t miss the stones. It was a bit of a wet, bleak day though so the walk across the open expanse wasn’t the most pleasant. There are lots of options for grabbing a bite to eat around the Island. We enjoyed a tasty meal in the Crofters Music Bar Bistro. Dog friendly, welcoming staff, above average food and there is often local music too. One afternoon we enjoyed amazing homemade scones, jam and cream at the Glenisle Hotel in Lamlash. We enjoyed it so much we went back for an evening meal. We had to eat in the bar rather than the restaurant, as we had Annie with us, but we enjoyed a really delicious meal. It is a bit more of a treat as it is more expensive than the usual pub grub but it is very worth it. There is a gorgeous cosy snug and a friendly atmosphere. Another reason Arran is a favourite Island is it is so easy to reach. The ferry from Ardrossan to Brodick takes less than an hour and Ardrossan is centrally located in Scotland. An hour and forty-five minutes from Edinburgh and under an hour from Glasgow. You can book here. 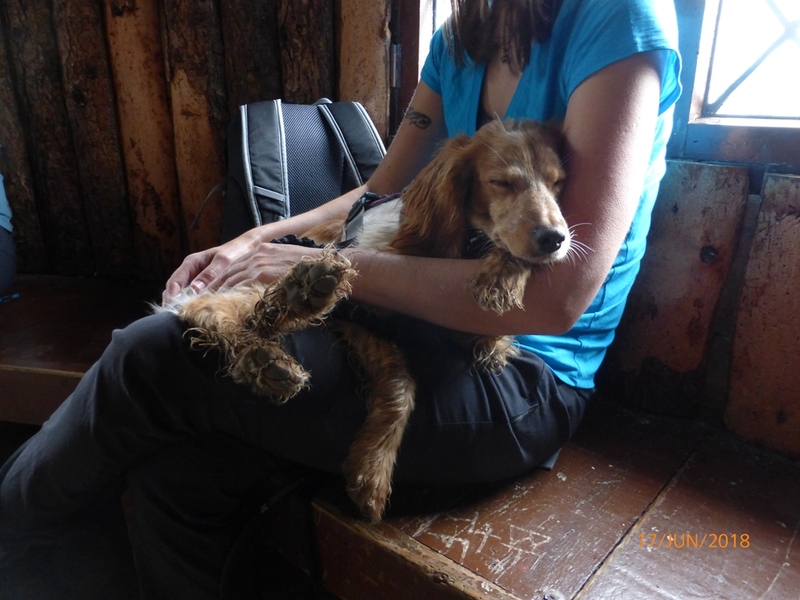 If you are visiting with a dog there are certain parts of the Ferry that are dog-friendly. They can get busy but, if it is a good enough day, it is worth taking in the view from on deck. All in all, for Annie’s first wee holiday, I would say it was a great success!